Welcome to my episode reviews of All or Nothing: Michigan Wolverines, which can be viewed on Amazon Prime Video. We kick things off with a detailed recap of Episode 1. The series starts with a meeting at the hotel prior to the start of the 2017 season led by Wolverines coach Jim Harbaugh. Harbaugh referenced his experience at Dairy Queen as a kid as others ordered ice cream with him saying that he didn’t like the flavor. Relative to football, he used the moment of a dark side to motivate the team. The video intro appears and then goes into the background of Michigan football with Mark Harmon as the narrator of the series. We go into Harbaugh’s time as quarterback at Michigan in the 1980’s and referenced what the late Bo Schembechler said about what the team needed. Schembechler cared more about how his guys would be as citizens 15-to-20 years later, which changed Harbaugh’s perspective on life. We segment into Michigan having to rely on a lot of underclassmen going into spring camp in 2017 as players such as Jabrill Peppers and Jourdan Lewis left for the NFL Draft. In a way to help build comradery, Harbaugh decided to fly the Wolverines out to Rome for a week in April of that year. The players were seen in bonding activities with various games akin to the old Ancient Rome. Harbaugh gave the Wolverine helmet to Pope Francis outside of the Vatican and exchanged some friendly words. Harbaugh also emphasized “Faith, Family and Football all in one” to the cameras. The grind of work was not lost as Michigan practiced in front of thousands of fans in Rome and at the end of the session, Harbaugh led the way in a rendition of Hail to the Victors, the school’s fight song. Fast forward three months later, the players moved to their dorms on campus in Ann Arbor. Harbaugh managed to find his old dorm room as a sophomore in the 1980’s. That room was occupied by freshman wide receiver Evan Latham and gave him a handshake. The next part focused on Rashan Gary bringing home C’s in seventh grade and how his mother, Jennifer Coney-Shepherd would not let him play football as punishment, which changed his perspective on academics. Since then, Gary has gotten A’s and B’s in all of his classes. Gary also keeps the delicate balance of being a star and an academic scholar. The first day of fall camp arrived on July 30 as Harbaugh used a poem as a reference point to inform players that no job will be won or lost in day one. 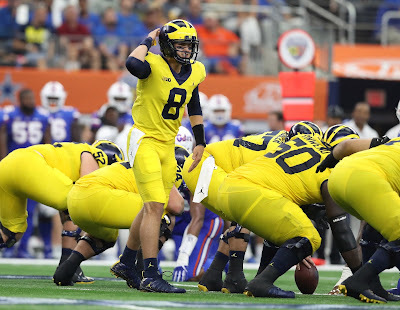 Assistant head coach Pep Hamilton talked with Harbaugh on who has the inside track for the starting quarterback job and both agreed Wilton Speight was the most impressive of the group. Speight and John O’Korn are profiled as they are shown taking reps at practice. O’Korn sat out the previous season after transferring from Houston and looks to win the starting spot in his final year of eligibility. We move to the coaches’ meeting two weeks later as Tim Drevno, Hamilton and Harbaugh compare the strengths and weaknesses of both quarterbacks. In his dorm room bed, O’Korn called former Houston Cougar teammate and current Texans defensive end Christian Covington about how grounded he felt in fall camp. Junior defensive end Reuben Jones put together his version of “Cribs” with a Michigan twist on the fourth floor of the dorm where he went into players’ lounges and rooms and promoted a laid back atmosphere as part of the culture. Gary has another conversation on the phone with his mother and reminds him to be his own man and to not work out without his gloves and retainer. The defensive end admitted he has and will always be a Momma’s Boy. Defensive coordinator Don Brown delivered a film session and went into the players about communicating better and developing more confidence for the younger guys who have not have had as many reps.
Michigan flew out to Dallas, Texas for the season opener against Florida at AT&T Stadium on Aug. 30 and got its first look at the facility. The Wolverines would receive motivating words from Dallas Cowboys players Joe Looney, Jourdan Lewis and Dez Bryant. Harbaugh held a press conference later that day not telling anyone who the starting quarterback would be leading up to the Florida game. However, on Sept. 1, Harbaugh would announce in a team meeting that Speight would get the start against Florida on Sept. 2 and told all of the other players to find someone to hit and to win for Michigan. Gary and Hurst were in their hotel room in which they talked about how Florida’s offensive line was better than Michigan’s defensive line. They used it as motivation to prove who is better on the field. Gameday arrived and Harbaugh talked to some of the players in the locker room and encouraged everyone to win for Michigan, which was the mantra throughout camp. The season opener kicked off as Michigan jumped out to a 10-3 lead on a Tarik Black caught a touchdown off a post route. From the press box, Hamilton called Speight to tell Black to challenge him to catch the lightning. Adversity hit Michigan as Speight through back-to-back interceptions, which resulted in Florida touchdowns as they trailed 17-10. Harbaugh made a cerebral move as he told the QB’s in the huddle that O’Korn would go in on the next series. The gamble paid off as the Wolverines scored the final 23 points on the way to victory over the Gators. - Rashan Gary stole the show in Episode 1 as his story about academics and phone conversations with his mother brought an escape away from the football stories.